Tumor angiogenesis plays very important roles for tumorigenesis, tumor development, metastasis, and prognosis. Targeting T1/T2 dual modality magnetic resonance (MR) imaging of the tumor vascular endothelial cells (TVECs) with MR molecular probes can greatly improve diagnostic sensitivity and specificity, as well as helping to make an early diagnosis of tumor at the preclinical stage. In this study, a new T1 and T2 dual modality nanoprobe was successfully fabricated. The prepared nanoprobe comprise peptides CL 1555, poly(ε-caprolactone)-block-poly(ethylene glycol) amphiphilic copolymer shell, and dozens of manganese ferrite (MnFe2O4) nanoparticle core. 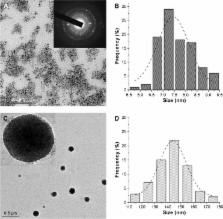 The results showed that the hydrophobic MnFe2O4 nanoparticles were of uniform spheroidal appearance and narrow size distribution. Due to the self-assembled nanomicelles structure, the prepared probes were of high relaxivity of 281.7 mM−1 s−1, which was much higher than that of MnFe2O4 nanoparticles (67.5 mM 1 s−1). After being grafted with the targeted CD105 peptide CL 1555, the nanomicelles can combine TVECs specifically and make the labeled TVECs dark in T2-weighted MR imaging. With the passage on, the Mn2+ ions were released from MnFe2O4 and the size decreased gradually, making the signal intensity of the second and third passage of labeled TVECs increased in T1-weighted MR imaging. Our results demonstrate that CL-poly(ethylene glycol)-MnFe2O4 can conjugate TVECs and induce dark and bright contrast in MR imaging, and act as a novel molecular probe for T1- and T2-enhanced MR imaging of tumor angiogenesis. Cancer constitutes an enormous burden on society in more and less economically developed countries alike. The occurrence of cancer is increasing because of the growth and aging of the population, as well as an increasing prevalence of established risk factors such as smoking, overweight, physical inactivity, and changing reproductive patterns associated with urbanization and economic development. Based on GLOBOCAN estimates, about 14.1 million new cancer cases and 8.2 million deaths occurred in 2012 worldwide. Over the years, the burden has shifted to less developed countries, which currently account for about 57% of cases and 65% of cancer deaths worldwide. Lung cancer is the leading cause of cancer death among males in both more and less developed countries, and has surpassed breast cancer as the leading cause of cancer death among females in more developed countries; breast cancer remains the leading cause of cancer death among females in less developed countries. Other leading causes of cancer death in more developed countries include colorectal cancer among males and females and prostate cancer among males. In less developed countries, liver and stomach cancer among males and cervical cancer among females are also leading causes of cancer death. Although incidence rates for all cancers combined are nearly twice as high in more developed than in less developed countries in both males and females, mortality rates are only 8% to 15% higher in more developed countries. This disparity reflects regional differences in the mix of cancers, which is affected by risk factors and detection practices, and/or the availability of treatment. Risk factors associated with the leading causes of cancer death include tobacco use (lung, colorectal, stomach, and liver cancer), overweight/obesity and physical inactivity (breast and colorectal cancer), and infection (liver, stomach, and cervical cancer). A substantial portion of cancer cases and deaths could be prevented by broadly applying effective prevention measures, such as tobacco control, vaccination, and the use of early detection tests. © 2015 American Cancer Society. Toxic potential of materials at the nanolevel. We previously identified the angiogenesis inhibitor angiostatin. Using a similar strategy, we have identified endostatin, an angiogenesis inhibitor produced by hemangioendothelioma. Endostatin is a 20 kDa C-terminal fragment of collagen XVIII. Endostatin specifically inhibits endothelial proliferation and potently inhibits angiogenesis and tumor growth. By a novel method of sustained release, E. coli-derived endostatin was administered as a nonrefolded suspension. Primary tumors were regressed to dormant microscopic lesions. Immunohistochemistry revealed blocked angiogenesis accompanied by high proliferation balanced by apoptosis in tumor cells. There was no toxicity. Together with angiostatin data, these findings validate a strategy for identifying endogenous angiogenesis inhibitors, suggest a theme of fragments of proteins as angiogenesis inhibitors, and demonstrate dormancy therapy. Folic acid-conjugated LaF3:Yb,Tm@SiO2 nanoprobes for targeting dual-modality imaging of upconversion luminescence and X-ray computed tomography. 99mTc-Labeled Iron Oxide Nanoparticles for Dual-Contrast (T1/T2) Magnetic Resonance and Dual-Modality Imaging of Tumor Angiogenesis.